May I begin by thanking Allah for making me the 3rd President of this great country through the support of the Gambian people. I seek guidance and blessing for me and my cabinet to have the strength and wisdom to serve our beloved nation to higher heights. I would like to first of all welcome the distinguished heads of states and international guests who are here to share this joyous occasion with us. Today is symbolic because of two important developments in the history of our dear motherland. It was on this day that The Gambia was declared Independent. I was just three days old. Now I am the President of the Republic of The Gambia after 52 years of nationhood. Few people would have thought that I will be addressing the nation today. I would like to thank the Gambian electorates for their astuteness. They exercised their civic rights in a peaceful and non-violent manner during the campaign, on election day as well as after the elections. I will not do justice without recognizing and expressing my sincere appreciation to the Gambian Diaspora. They spent time and resources to support my candidacy through the social media. They encouraged family members and friends to vote for me. This is a victory for democracy. It is a victory belonging to all Gambians. It is the decision of Gambians to change a Government which has entrenched itself through the ballot box. That has made it possible for us to gather here today. I wish to take this opportunity to thank the Gambian people, ECOWAS, AU, The UN and all our international partners in general for supporting us at the most critical period of our history. This has ensured that democracy has a meaning to our people. Gambia has changed forever. The people are fully conscious that they can put government in office as well as remove it. 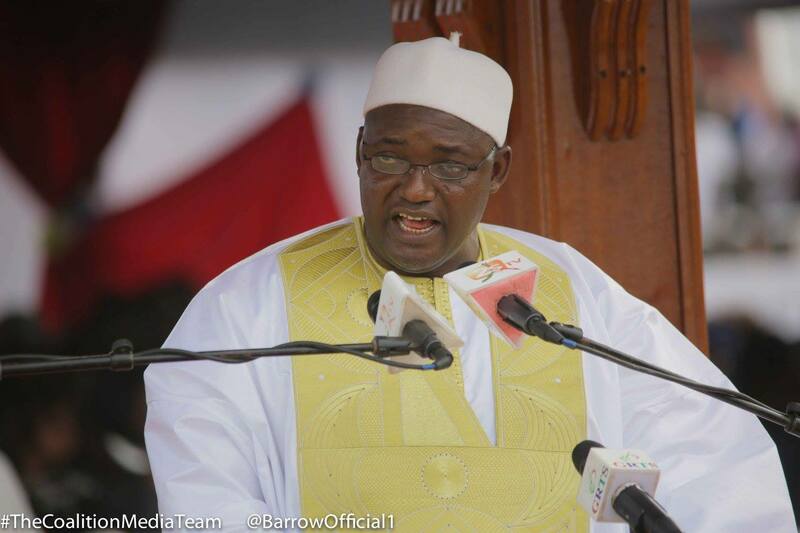 No government will ever be able to entrench itself against the will of the Gambian people. This is the lesson we must draw from the change that has been brought by the people. We are now confronted with many challenges. We have inherited an economy that has declined because of political uncertainty. During the political impasse, businesses were shot down, offices and schools were closed. Foreign missions scaled down their staff, 50, 000 left the country and over 126, 000 became internally displaced. People restricted their movements and the country became ungovernable. The country would have remained in such a situation if the new government did not succeed in finding a solution to the impasse. The Government under my Presidency will strive to ensure the survival, protection and development of all children. The Ministry of Health and Social Welfare is charged with the responsibility of doing an inventory on the needs of the hospitals in the country in order to determine the inputs necessary to upgrade health services. It is to ensure staff audit in order to identify constraints and develop programmes to enhance staff motivation. The Government will seek to partner with ECOWAS, AU, the UN, other traditional development partners like the US, the EU, UK and new development partners to improve on infant and maternal health. The aim is to improve their well-being and reduce mortality. We will work to improve nutrition, sanitation, access to clean drinking water and ensure that primary health care is accessible and affordable to both rural and urban centres. The law of the land instructs that basic education shall be free, accessible and compulsory. All Gambian children must go to school. The Gambia under my presidency will respect the dictates of the Constitution and work with our development partners to make free education for all a reality. Agriculture shall be given added support to move towards food security and growth in export. Production and processing crops, livestock and fisheries will serve as the base for food security. These will be linked to job creation and increase in income through Agro-Industrial development. The service sector, which is now the largest contributor to the Economy, will be given the incentives necessary for them to contribute more to employment creation and the GDP of the country. Macro-economic stability will provide a fertile ground for telecommunication services, banks, hotels, insurance, housing companies and other sectors to grow and develop partnerships in Africa and all over the globe. The Ministry of Information and Communication Infrastructure will be given support to sustain its local area networks. This will make it possible for the Government to maintain the regional community information centres and provide them with the necessary ICT services. The e-government data centre will create better coordination and cooperation between government institutions. The media, both public and private, will enjoy freedom to disseminate divergent views and dissenting opinion as required by the Constitution. The Media Law shall be reviewed and code of conduct for responsible journalism promoted. This will include re-orientation of the state media to take up its public service responsibility. As part of the reforms to be undertaken to improve on job creation, e-government will be utilised to ensure that the Personnel Management Office and the Labour Department would be able to store data on those seeking employment and the jobs available at each given period. This will facilitate proper assessment of employment and unemployment rates especially among the young people. The Government will undertake a major drive to promote employment in all sectors. In the area of infrastructural development the Government will give the Ministry of Works, Construction and Infrastructure time bound deadlines for the construction of the Basse-Fatoto, Fatoto-Koina and Laminkoto-Pasamas roads. The ministry will undertake to identify all the key feeder roads in the country that require feasibility studies to prepare solid plans to source funds for their construction. In the area of Energy, the ministry is charged with the responsibility of ensuring adequate and affordable electricity supply by diversifying energy sources for basic household needs. The energy sector would be improved. The development of port facilities, road infrastructure, river transport and other services will attract foreign direct investment at a larger scale. The Ministry of Petroleum will focus on developing the potential to exercise control and direction over the seismic surveys being done to explore the potential for oil production in the country. Industrial production shall be expanded to include robust development of the mining sector and the processing of raw materials into value added goods. Transparency will be shown in this area to enable the people to know all developments regarding the sector. Civil Service Reform will be undertaken to link appointment to merit and income to performance. A Ministry of Planning and Good Governance is to be established to facilitate and monitor the development and implementation of a blueprint for Socio-Economic development. The Provision of quality social services is the fundamental objective of the government under my Presidency. This would require sustainable Macro Economic stability and growth. This is why I established a Think Tank, The Agency for Sustainable Socio-Economic Development (ASSED). It is charged with the responsibility to establish an expert bank. This will provide data on the different expertise available to share their knowledge and skills. Their expertise will be tapped in order to put in place an inclusive development agenda. Regional administration will be done by public servants not political appointees. The pay and grading structure of the civil service will be reviewed and pensioners will also benefit from the reforms. State enterprises are to be reviewed with the view to adopt policies that would ensure that they pay dividend to government instead of being a liability. The Government will undertake key constitutional and legal reforms which will be highlighted in my first address to the National Assembly. It intends to enforce constitutional provisions that are entrenched to protect the fundamental rights of the citizens. Orders have already been given for all those detained without trial to be released. The Attorney General and Minister of Justice will receive information regarding all those who are arrested without being traced. An appropriate commission would be established to conduct inquiries into their disappearances. A Human Rights Commission will be established without delay to complement the initiatives of the Attorney General. The National Council for Civic Education will be provided with the facilities to conduct civic education to promote national reconciliation in collaboration with other organisations that are set up to promote national unity and reconciliation. The judiciary will receive adequate support in terms of personnel and independence to enable it to deliver justice without fear or favour. The Gambia during the impasse knows what solidarity means. Senegal has proven to be a friend in times of need. The people of Senegal hosted the people who fled and the government hosted me as President-elect and worked hand in glove with ECOWAS, The AU, UN and the international community in general to ensure that the verdict of the Gambian people is not violated. In this regard, my first trip as a head of state will be to Senegal so that we could discuss and conclude on matters such as the SeneGambia bridge, our common borders, the status of the Senegalo-Gambian Secretariat and other outstanding issues. We want the relation between the two countries to be a model for African integration. I would like to give special thanks to President Ellen Johnson Sirleaf, the Chair of ECOWAS, President Muhamadu Buhari of Nigeria, President Ernest Bai Koroma of Sierra Leone and former President John Dramani Mahama of Ghana who undertook the first mediation efforts. I cannot conclude without adding the names of President Alpha Conde of Guinea and President Abdul Aziz of Mauritania who stepped in at the right time. My special gratitude is also extended to my host President Macky Sall of the Republic of Senegal during the impasse. I was given a choice by ECOWAS to stay in Liberia, Nigeria or Senegal during the impasse. I chose Senegal because of the fact we are the same people occupying two different countries. I must say I made the right choice and received the greatest hospitality. Your Excellences, honourable guests and fellow citizens, I would like to conclude by emphasizing that for 22 years the Gambian people yearned to live in a country where our diversity will be bridged by our tolerance and our determination to work together for the common good. We decided to form a Coalition so that those speaking Jola, Serer, Aku, Serahuleh, Manjago, Mandinka, Fula, Wollof and all other groupings would ensure that we build One Gambia, One Nation and One People. Justice will guide our action and this Government intends to maintain that spirit of national unity. The whole world supports us and The Gambia will remain a beacon of peace and hope for others to draw lessons from. Long Live The Republic! Long Live the United People of The Gambia! Forward Ever! Backward Never!